” historical marker at the site of two hotels in downtown Jackson was dedicated on Friday, May 14. From 1832 to 1856 the Eagle Hotel stood on the corner of State Street and Amite where the Standard Oil Building now stands. Andrew Jackson stayed there during his visit to the city in 1840. The Bowman House was built on the site in 1857 and burned in 1863. It was the site of frequent political and social events and served briefly as headquarters for both Union and Confederate armies during the Civil War. Two of Jackson’s historic hotels once stood at this site. The Eagle Hotel, originally a tavern, was built in 1823. Andrew Jackson was a guest here in 1840. Alexander McClung, editor and Mexican War hero, committed suicide at the hotel in 1855. The Eagle was torn down in 1856 and replaced in 1857 by the Bowman House, a five story brick structure. 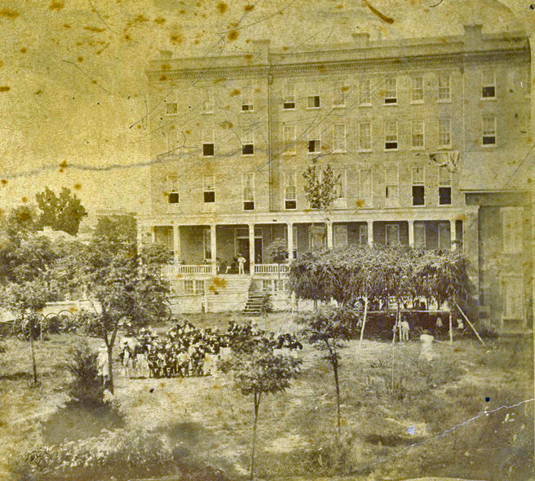 The scene of frequent political and social events, the hotel also served briefly as Union headquarters on May 14, 1863. Is this the old Sidney House – hospital in Vicksburg on Crawford street? It was also known as the Vicksburg Sanitarium (Street’s Sanitarium) [Sydney Building]. It was across the street from the WPA-era Crawford Street Post Office. Crawford Street Methodist Church now owns the property and a new building is on the site. When the old Sidney House was torn down, I saw tile pools/hot tubs in the cellar, and an old-timer told me these were for polio victims. No, it is the Bowman House in Jackson. Ed and Carunzel, what am I going to do with you two! Battling for the lead late in the competition and both submitting the correct answer at the same time. I am going to have to go and read the tea leaves in my Mississippi Preservationist Extraordinaire goblet and see how I am going to sort this out. In the end, Ed’s comment shows up first. It shows up first on the admin page. It shows up first in my email inbox. It shows up first in the comments section. He gets the point for identifying it and the additional point for adding more information about it. Carunzel detailed the building’s history and gets one point. I guess he got here a few seconds before me, but I got nearly every other possible detail there is, and well before him. hm-m-m-m; if there is one thing I have learned doing this quiz is that ‘the person who hesitates loses’–and, when I went online and saw the photo, I was only concerned with sending in the basics–building, location, style, ‘birth’ and ‘death’—and, when I went back online, there were also no ‘extras’—so, that’s when I decided to send in my ‘extras’–as did others! and, to think that my laptop is ‘barely working’ after the problems this morning–it will need the weekend to calm down! These posts will be left up (all Preservation in Mississippi posts are and can be found by clicking the “Archive” tab at the top of the page), so discussions can keep going on in the comments section. At five habitable stories this is the tallest building, that we’ve had in this Name This Place contest.